We’re now IN for the Disneyland 5k!! The insanity continues! On Monday, I reported how Jackey and I took the plunge and registered for the Disneyland Double Dare Challenge after learning the themes will be Monsters Inc for the 10k and Toy Story, TOY STORY for the half marathon! 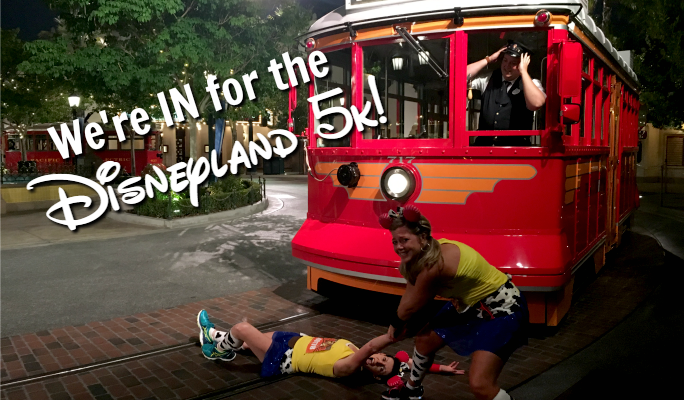 But we were both a little bummed over the 5k being sold out, considering the total blast we had last year and how it’s now our favorite runDisney 5k. Well, guess what? Still can’t believe this, but we found a travel agent who still had bibs available for the original price of $80.00!! Jennifer from Wish Upon A Star With Us took great care of us plus they still have 5k bibs left, as well as the other Disneyland Half races and other race weekend. Now the big question is … what costumes are we going to wear? 1.) I’ve gone back to wearing my boot 24/7 for the next month after reading how a woman finally healed from her partial plantar plate tear by isolating and babying her foot for a month. Is it necessary? I don’t know. But it’s worth a shot! 2.) I’m also backing out of the Cherry Blossom 10-Miler which is such a bummer, considering Jackey, Megan, and Shannon, (the gal who shared our Wine & Dine Half Marathon adventure,) are all going as well as many members from my running group. But … and I don’t mean any disrespect with this … the Cherry Blossom isn’t a high priority or a major race for me. The Broad Street 10-Miler is, but more importantly, Disneyland and the Dopey Challenge are my top goals. So I need to heal! And fast! So next Thursday, I’m going back to the doctors for custom orthotics and perhaps another MRI referral. Fingers crossed! Until then … have I mentioned yet how unbelievably EXCITED we are????? Can’t wait! !